That’s all from Us. Nigeria go top of Group C standings. Sudan XI: Muhammad Nashnoush, Sanad Maoud, Ahmed El Trbi, Motasem Sabbou, Ahmed Al Maghasi, Mohamed Aleyat, Bader Ahmed, Abdulrahman Ramadhan khalleefah, Saleh Al Taher, Salem Ablo, Omar Aribi. Nigeria XI: Ikechukwu Ezenwa, Osas Okoro, Daniel Itodo, Stephen Eze, Kalu Orji, Emeka, Atuloma, Ifeanyi Ifeanyi, Rabiu Ali, Emeka Ogbugh, Anthony Okpotu, Sunday Faleye. 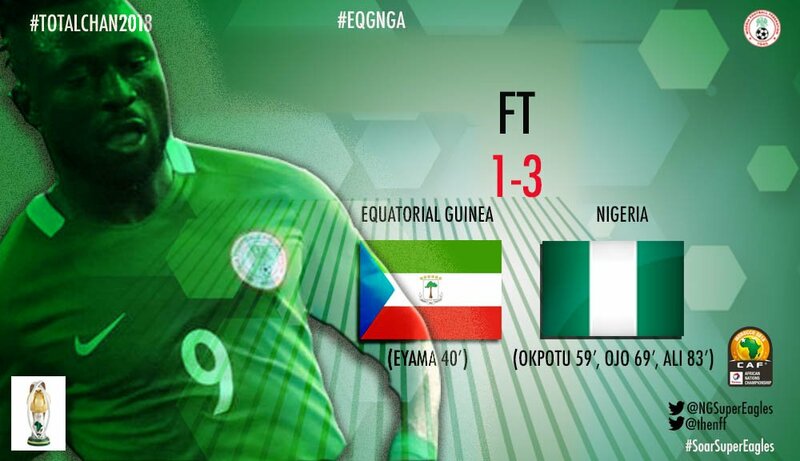 90+2′ Full-Time: Equatorial Guinea 1-3 Nigeria. 83′ – GOAL! Rabiu Ali makes it 3-1 from the spot and that’s game.set.match for the Super Eagles! 77 Ali takes it, Ali scores. 76 NGSuperEagles awarded a penalty after Okpotu was fouled in the 18 yard area. 54′ – Yellow Card, Atom goes into the referee’s book following a cynical foul. 50′ – CHANCE! Half chance for Anthony Okpotu after the Equatorial Guinea goalkeeper fails to catch a ball floated into the area, but he is unable to capitalize. 46′ Second half. 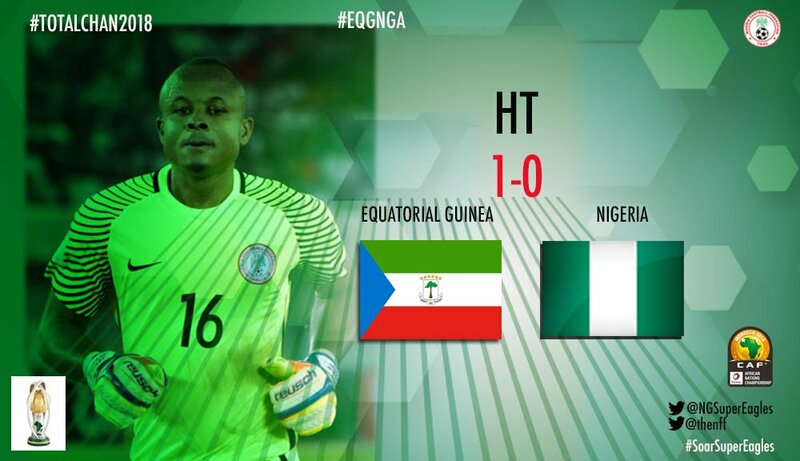 Equatorial Guinea 1-0 Nigeria. NGSuperEagles have so much to play for. 43′ – CHANCE! Guilt-edged chance squandered by Sunday Faleye as he fires wide with the goal at his mercy! That should have been the equalizer. 40′ – GOAL! Shock horror for Super Eagles fans as Nsi Eyama Salvador powers home a header from a corner-kick to give Nzalang Nacional a surprise lead. 36′ – Yellow card, Stephen Eze of Nigeria is next to go into the referee’s book. 30′ – Half-hour played in the Group C clash, but nothing to write home about just yet. 26′ – Free-kick for the Super Eagles – Osas tries his luck from range, but he fails to hit the target. Rather subdued start to proceedings in Agadir. 20′ – Yellow Card, Maye of Equatorial Guinea goes into the referee’s book. 16′ – Spell of pressure from Equatorial Guinea as they win their first corner-kick of the match, but Nigeria successfully see out the danger. 10′ – CHANCE! Stephen Eze with good movement to lose his marker, but the centre-back’s resulting header flies wide of the mark. 8′ – Free-kick for the Super Eagles on the far side of the pitch. Ball fired in by Ogbugh, but it lacks real direction as Equatorial Guinea eventually clear from danger. 2′ – Dayo Ojo has an early pop at goal from the edge of the area, but his attempt was always rising. Good fast start by the West African’s who are desperate to avoid elimination. 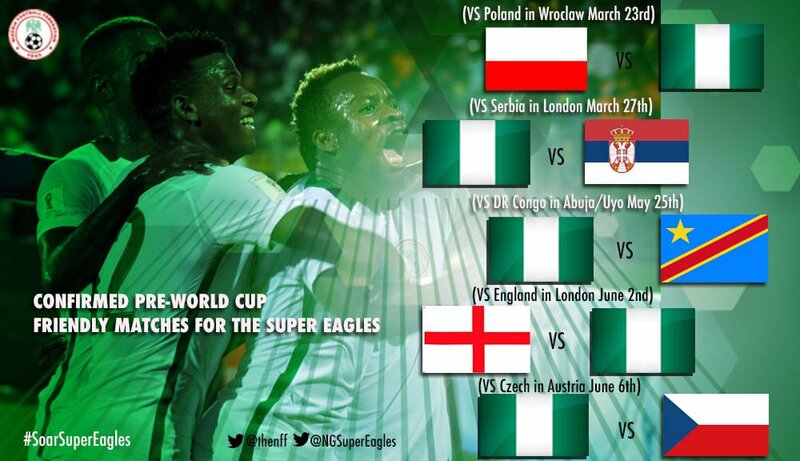 1′ – The Super Eagles get proceedings underway.